Shielding gases for welding are standardized in DIN EN 439. Gas-shielded aluminum welding (see Aluminum welding, Gas-shielded welding processes, Welding of die cast parts) is mainly based on the inert gases argon and helium as well as argon/helium mixtures. In addition to the actual shielding function, the composition of the gases may be used to influence the penetration profile, degassing behavior and also the arc stability, i.e. the welding behavior. Due to its high density (relative density to air = 1.38), argon is particularly well suited for shielding the weld pool. Moreover, the relatively low ionization voltage facilitates arc ignition. Helium is primarily derived from natural gas. Due to its low density (relative density to air = 0.14), the shielding effect is rather low. Nonetheless, its very good thermal conductivity and its ability to transfer heat stored in the gas onto the component, have a very positive effect on the welding of aluminum materials. The elevated ionization voltage makes it more difficult to ignite the arc and increases the operating voltage and therefore the energy per unit length with the same arc length which also has a positive effect on the thermal efficiency of the arc. However, because of the low density, a larger amount of gas is required to shield the arc and the melt. 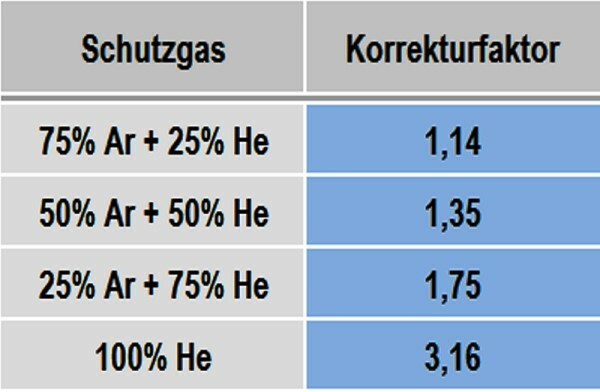 The properties of argon/helium mixtures are essentially determined by the proportions contained in the mixture. In order to assess the flow rate of argon/helium mixtures and helium, Table 1 can be used when applying argon pressure reducers. The actual flow rate is the measure indicated by the flow meter or pressure reducer, multiplied by the correction factor. Leading suppliers of shielding gases for welding are the Linde Group and the Messer Group.